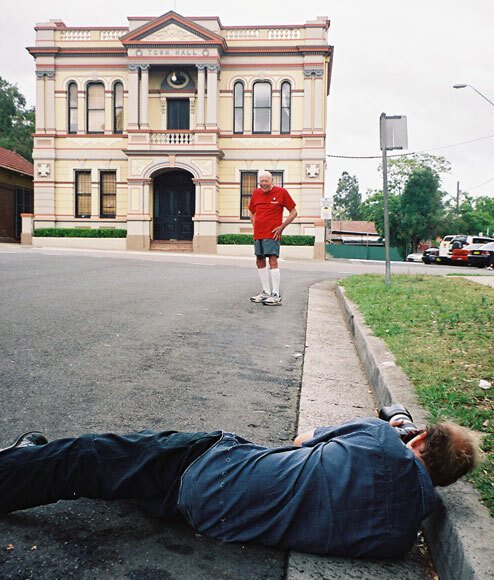 This site is primarily about an unusual collection of over 3,500 photos of Sydney taken whilst walking every street, lane, bush track etc in 292 suburbs of Sydney. There have been over 4,695,000 pages viewed by over 1,749,000 visitors from 184 countries (latest new one is Sao Tome and Principe) - see Visitor Countries for full list. Australian Olympic medallist and now newspaper and TV personality, Elka Graham, joined Alan for another walk, this time with fiance Thomas Whalan at Balmoral Beach. Thomas is also an Olympian and captain of the Australian water polo team. If Elka and Thomas, two delightful people, are typical of their sports, you couldn’t do better than encourage your kids to take up swimming or water polo. The report in Town Talk column commended "Amanda, a young mother with two infants, [who] insisted Alan take a bottle of cold water and a donation for his charity [the Heart Foundation]." 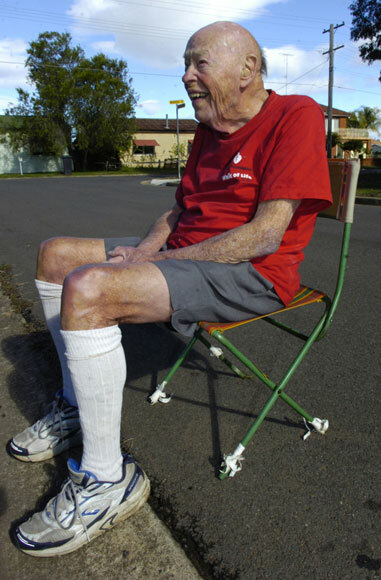 The Western Sydney newspaper Mount Druitt & St Marys Standard caught up with Alan on one of his days of walking in their territory, and kindly supplied some professional photos to contrast with the amateur ones of Alan that you are used to seeing. Standard reporter Laura Cencigh and photographer Armen Deushian (who complained that Alan was walking too fast for the camera) never stop smiling. Here is their article "On a mission to walk". 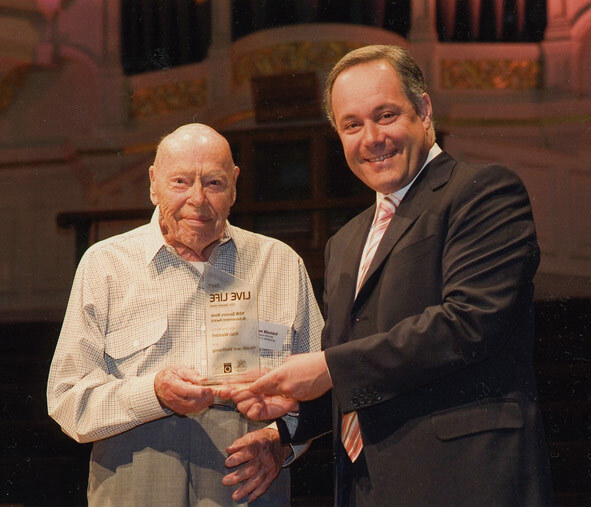 The New South Wales Government has honoured Alan with an award for promoting health and wellbeing. 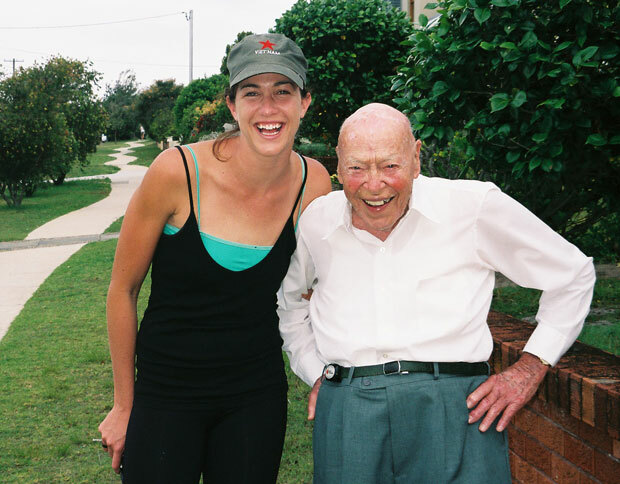 It recognised his motivating people to improve their health by walking and his work for organisations such as the National Heart Foundation; Department of Ageing, Disability and Home Care; and the Sydney Harbour Trust. 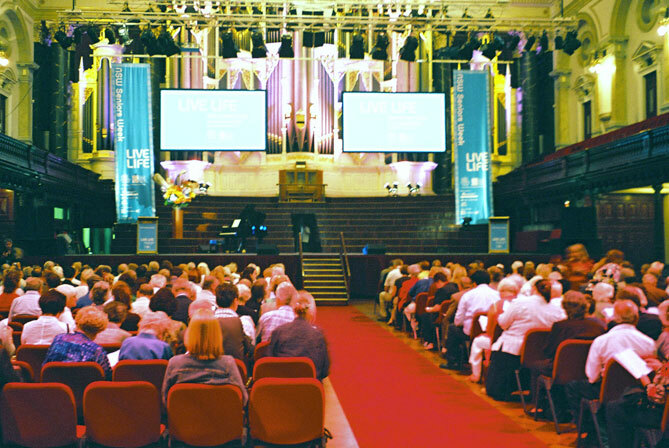 An interview about Seniors Week with 2UE's afternoon presenter, Glenn Wheeler, concluded with a no-holds-barred fight over who was going to win the football match that evening. Alan told Sharks-supporter Glenn that "you haven't got a hope" against the Panthers. The Sharks won 18-0. Both papers carried a story about the two North Shore ambassadors for Seniors Week, Alan and Cornelia Francis. Cornelia appears in the TV programme Home and Away, but is best known for hosting the game show The Weakest Link. Two items about Alan's activities appeared in this edition of The Sun-Herald. One was on his leading of a walk through the back streets of Edgecliff; the other was part of an article about the ambassadors for the New South Wales Government's Seniors Week. Other ambassadors are actor Marcus Hale, nutritionist Rosemary Stanton, actor Henri Szeps, Logies award winner Judy Stone, actress Benita Collings and TV host Donnie Sutherland. The Herald's "Webwatch" page ran an item about Alan's walking, including the comment that "the result is this website, which gives an amazing peek into the fabric of our city." 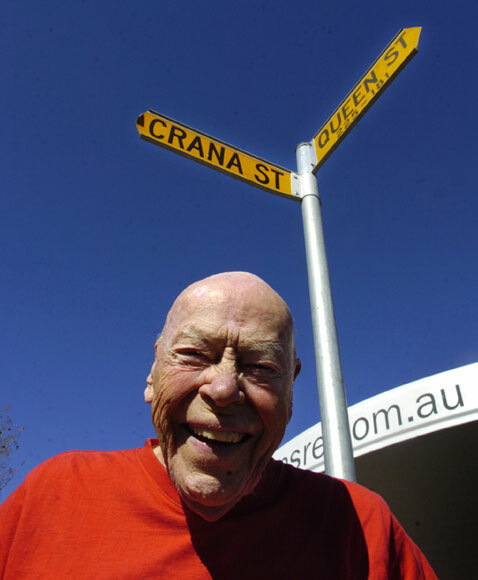 A photo of Alan walking in Granville occupied almost a half of the front page of the Auburn Review, with the story and a further photo inside. Should we tell the editor of the Auburn Review that his staff were lying down on the job? The same story as appeared in the Auburn Review, but different photos, were used by the Review's stablemate. Their combined circulation is 120,000. David Evans interviewed Alan for his breakfast programme broadcast on the ABC's New England North West radio network. This covers the northern inland area of the state. Alan showed his versatility and capacity for innovation when he managed to squeeze several buttons on the phone while on air, causing Mr Evans to have to ring him back. Elka Graham is an Olympic silver and World Championships gold medallist in swimming. More than that, she is one of the nicest people you could meet. Elka and Alan are both media ambassadors for Australia’s National Heart Foundation. The swimmer and the walker exchanged experiences during a 70-minute stroll. 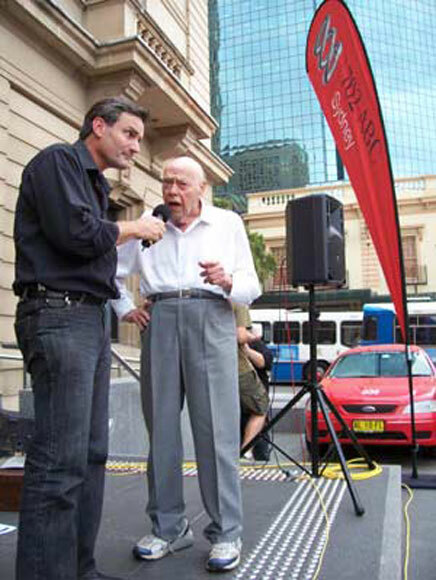 In the photos at left (courtesy of ABC) and below, Alan is being interviewed by Richard Glover at the Customs House outdoor area near Circular Quay. 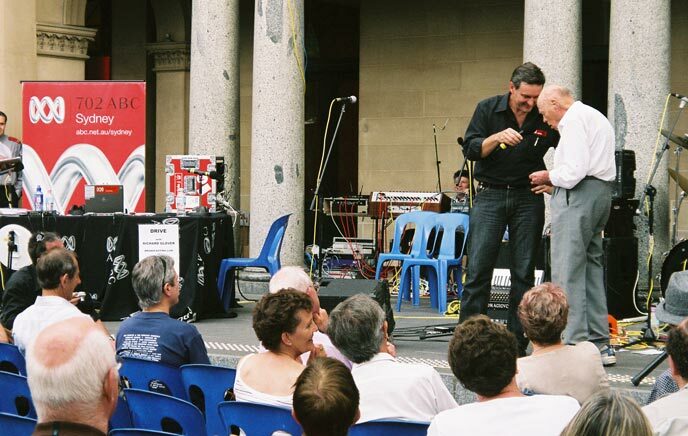 ABC radio conducted several outside broadcasts as part of their support for Diabetes Australia. Alan was a guest in Richard Glover's drive programme from Sydney city. 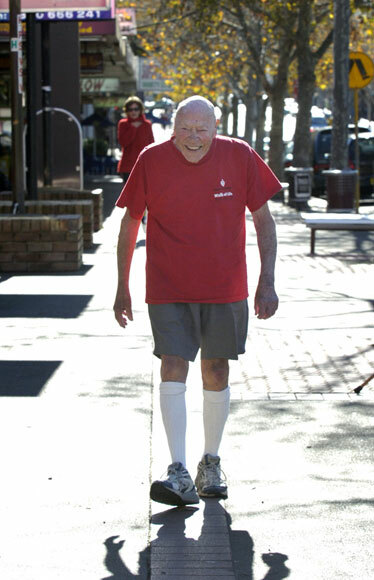 It was to promote the benefits of walking for minimising risk of contracting diabetes.